Travel Gifts are designed to make anyone who travels more comfortable by making those long trips easier. As a RoadPro Distributor, RoadTrucker® features RoadPro′s Travel Gifts which were designed for Truckers, RVers and Travelers. RoadPro's Travel Gifts come backed with RoadPro′s standard 90 Day warranty. Some Travel Gifts were made for use in a 12-Volt vehicle and most will work in a car (Personal Cooler Warmers, Low Powered 12-Volt Refrigerator Freezers and CB Radios). RoadPro's 12-Volt Travel Gifts were designed for use in Trucks and RVs which have special 12-Volt receptacle′s that can handle the power used. Travel Gifts, Truck Accessories and 12-Volt Appliances will make your life on the road much more enjoyable. Travel Gifts make great gifts for almost anyone who travels. 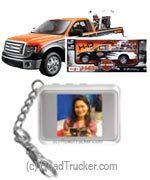 Our focus is on RoadPro Travel Gifts, 12-Volt Trucking Appliances and Truck Accessories and like RoadPro, we back our Travel Gifts. Know someone who drives? A Travel Gifts or travel Appliances will be a welcomed gift idea, not to mention it will add to the enjoyment of their journey. Here is a Travel Gift suggestion, followed by a list of some of the Travel Gifts we carry. 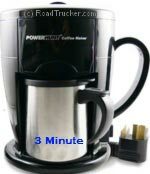 In addition to Travel Gifts RoadTrucker® carries Truck Accessories and 12-Volt Appliances like 12-Volt Coffee Makers, 12-Volt Coolers and many other items of use for truckers, RVers and travelers. See our Truck Product Catalog Pages for details. If you have ever been wandering around, exploring a strange city, you have probably found yourself lost or worse, in a cab taking you (by way of the scenic route) back to your hotel when you wanted the direct route. Just pop a way-point with this GPS and no problem finding your way back to the meeting place. Another gift that will be a big hit is the Wondergel Comfort Seating System which will help protect your back and neck and increase circulation. A Wondergel Comfort Seat is a Must for the Long Hauler or for that matter, anyone who sits for long periods of time. I'm speaking from experience because I bought 2 of them. 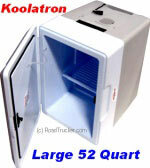 We also have picked up the full line of Koolatron 12-Volt Coolers which Cool to 45 degrees below ambient, making them the best Cooler on the market today. Enjoy longer road trips with a Reasonably low battery usage (Averages approximately 4.5 amps) and safe operation with No Open flames, Propane, or Toxic Refrigerants used. Travel in style with an elegant briefcases at RoadTrucker. Travel briefcases with aluminum exterior are available. Don't let discomfort ruin your perfect road trip! 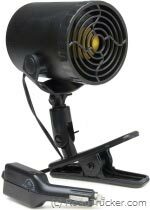 RoadPro brings you a 300 Watt 12-Volt Heater-fan for a dependable heating or cooling unit. Feeling chilly while on the road? Enjoy the warmth inside your bunk with RoadPro's 12-Volt Heated Fleece Blanket. Plugs into 12-volt cigarette lighter. Heavy Duty Jumper/Booster Cables that gets Your Dead Battery Going with 300 Cold Cranking Amps. A very unique gift for that Trucker in your life, is the War-Lok TAB-10 Air Break Lock. It's a very easy lock to use and will protect your truck while you run in for coffee or any other time you leave the Truck running. The 3 Outlet 12-Volt Lighter Adaptor is arguably the most useful device made for truck or car. Its like having a multi-plug for devices that use the cigarette lighter. Allows the use of 3 12-volt devices in the same plug. 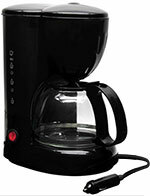 Plug in your radar detector, your air ionizer and your coffee pot, at once. Tired of your truck smelling like old socks? This wonderful little 12-Volt Ionic Air Purifier Ionizer plugs into your lighter and quietly works to get rid of those odors, creating a clean fresh environment for those long hauls. The RoadPro 12-Volt Tornado Fan is the most powerful 12-volt fan featuring adjustable speed control and a mounting clip for easy positioning. Full Tilt Articulation adds to flexibility and a mounting base is included if you want a permanent mounting setup. Electronic Kid Travel Games. What a great source of entertainment while your traveling on the road. Electronic Travel Games provides hours of fun and entertainment. Games always make a wonderful gift idea for any occasion. What an enjoyable way to Pass the Time when you are Waiting to Load.